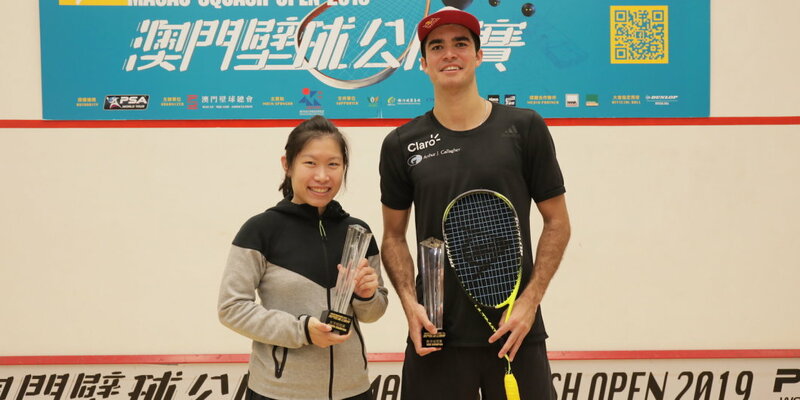 Peru’s Diego Elias and Hong Kong’s Annie Au are the 2019 Macau Open Champions after defeating Egypt’s Omar Mossad and Malaysia’s Low Wee Wern at China’s latest PSA tournament. Despite the weather preventing glass-court action, spirits were high for the final of the PSA Bronze event. World No.9 Elias dominated the court taking the first game 11-3 and second 11-4. World No.12 Mosaad picked up the pace in the third and fought back from 6-3 to equal the score at 6-6 but wasn’t able to able to defeat the Peruvian with the game ending 11-9. “That wasn’t easy at all today,” said Elias following his win. “It might have looked so, but it wasn’t. I played a really good tournament and I’m happy with my performance. I’ve been playing better every day and I knew today was going to be a lot harder playing against a player like Omar. Meanwhile, in the women’s final, Au stole the show beating Malaysia’s Low Wee Wern to the trophy in straight-games. World No.11 Au has competed in the Macau Open several times and played an impeccable game against the Malaysian. Au took the first game easily but Wee Wern put up a fight in the second and levelled the score at 10-10, but Au didn’t go down and managed to bring it back from being a match ball down to taking the second in 13-11 and third 11-8. “I’ve been playing this event for many years and in the last few, it’s either the semi-finals or once the final. So to win, it, I feel very happy that I took the opportunities I had this year” said Hong Kong’s No.1 Au. “It also feels rewarding because I’ve had pretty tough matches in the beginning. It took me a while to get into this tournament, but luckily I managed to settle in the last two matches. “(Low) Wee Wern has been playing really well this event, so I knew she was going to be a tough customer. I was expecting very tight points and they were. We’ve played each other many times, so we are both familiar with each other’s game”. 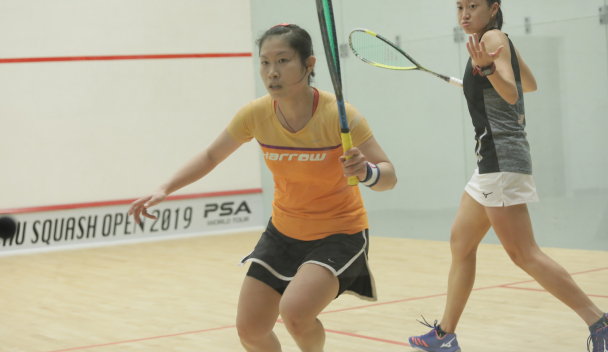 Malaysia’s Low Wee Wern continued her impressive run of form at the Macau Squash Open after she reached her biggest PSA final in seven years following her win against Egypt’s Zeina Mickawy in the semi-finals of the PSA World Tour Bronze tournament. Having taken out second seed Salma Hany in the second round, then Nadine Shahin in the quarters yesterday, Low beat a third Egyptian Zeina Mickawy in four games in the semi-finals. It’s the Malaysian’s biggest PSA final in seven years after she came back on tour following a 20-month injury lay-off. “I think I played one of my best this week, so far, “ said Low following her victory. “I was a lot calmer on court. Even though I lost the crucial first game, I was actually quite calm. I was finding my length and the corners pretty well today. It’s a good improvement for me to get better day by day. She will face Hong Kong’s top seed Annie Au in the final after she powered past India’s Joshna Chinappa to reach the final. “I knew it was going to be a hard match today,” said Au. “Joshna and I practice a lot together on tour, so we are very familiar with each other’s game. Moreover, we also play against each other a lot in Asian continent events. So I knew it was a tough one. The men’s final will be contested between Peru’s Diego Elias and Egypt’s Omar Mosaad after they claimed respective semi-final wins over Hong Kong’s Tsz Fung Yip and Scotland’s Greg Lobban. “This is a special event for me,” said Mosaad following his victory. “I’ve reached the final here for the fourth time today. The change of court halfway back here was a little tricky for me. There was nearly an hour delay before we restarted. I actually started back really well, but then Greg started to play even better. The third was important for me to get the lead again. Then in the fourth, it was pretty much point-for-point. While Mosaad has plenty of experience here in Macau, his opponent tomorrow will be a first-time finalist here. Top seed Elias edged out defending champion Yip in a match that truly showcased both their amazing skills. The pair, who both play a very similar game of very calculated lengths and deft drops, entertained the crowd for a full 53 minutes. 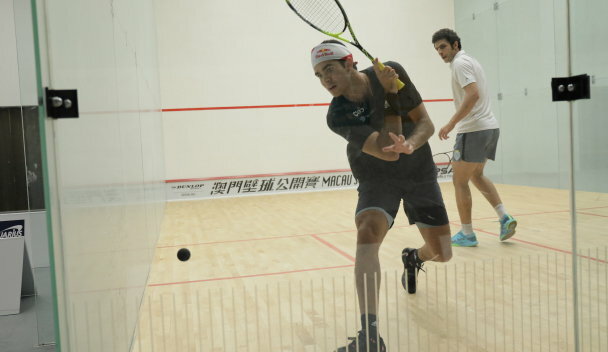 Peru’s World No.9 Diego Elias has been seeded to face India’s World No.12 Saurav Ghosal in the final of the 2019 Macau Open after the main draws for the PSA World Tour Gold tournament were released today. The pair will lock horns in the final at the Tap Seac Square, if they can make it through a high-quality draw which will battle it out in Macau, China, between April 10-14. Elias, who along with the other top eight seeds receives a bye into the second round, will come up against tough competition in his side of the draw from the likes of 2018 winner Hong Kong’s Tsz Fung Yip, who he is seeded to meet in the semi-finals, and Yip’s compatriots Max Lee and Leo Au. Meanwhile, at the opposite end of the draw, Ghosal could face Egypt’s former World No.3 and last year’s runner-up Omar Mosaad for a place in the final. Scotland’s Greg Lobban and Malaysia’s Nafiizwan Adnan are also seeded on his side of the draw. The wildcard spots in the men’s draw are occupied by Macau’s Manuel Gassmann and Hong Kong’s Tsz Kwan Lau, who will face Malaysia’s Ivan Yuen and Spain’s Edmon Lopez in round one, respectively. Hong Kong’s World No.11 Annie Au, who reached the semi-finals at last year’s tournament, tops the women’s draw and is seeded to meet Egypt’s World No.12 Salma Hany in the title decider. India’s World No.16 Joshna Chinappa is set to face Au in the last four, while Hany, who finished runner-up at last year’s tournament to compatriot Nouran Gohar, could come up against Hong Kong’s World No.18 Joey Chan in the semi-finals as she looks to do one better this year. Meanwhile, the wildcard spots are taken up by Macau’s Liu Kwai Chi and Hong Kong’s Chan Sin Yuk, who will face Japan’s Satomi Watanabe and New Zealand’s Amanda Landers-Murphy, respectively, in round one. Both the men’s and women’s draws will be contested by 24 players, while a prize purse of $100,000 will be split equally between the male and female players.